Culpepper had an outstanding collegiate career, capped by completing 73.6 percent of his passes for 3690 yards and 28 touchdowns while averaging 9.2 yards-per-attempt as a senior in 1998. He also rushed for 463 yards and 12 TDs and was chosen by the Vikings in the first round of the 1999 NFL draft (11th overall). Culpepper saw no action as a rookie, but with the departure of veterans Jeff George and Randall Cunningham after the season, he moved into the starting lineup in 2000. Vikings went 11-5 to finish first in the NFC Central. Won NFC Divisional playoff over New Orleans Saints (34-16). Lost NFC Championship to New York Giants (41-0). Culpepper had a lesser season in 2001, missing the last five games of the year due to injury and drawing criticism for lack of preparation. He came back to throw for 3853 yards and 18 touchdowns in 2002, but also led the league with 23 interceptions, although his 609 rushing yards and 10 TDs were career highs. Culpepper improved in 2003, passing for 3479 yards and 25 TDs with just 11 interceptions, and in 2004 led the NFL with 379 completions and 4717 yards while tossing 39 TD passes and accumulating a 110.9 passer rating. He was selected to the Pro Bowl after both seasons and was a first-team All-NFC choice by Pro Football Weekly in ’04. But after achieving that peak, Culpepper had a poor season in 2005 before going down with a knee injury and, with a coaching change taking place, he was traded to Miami, where he started four games and was hampered by limited mobility before having to undergo a second knee operation. 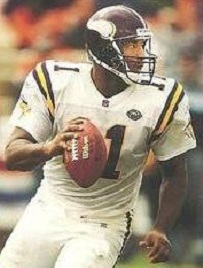 Culpepper had stints with Oakland and Detroit over the remaining three seasons of his NFL career, never appearing in more than seven games and with reduced production. He finished up with the Sacramento Mountain Lions of the United Football League in 2010, where he passed for 1910 yards and 10 touchdowns in his final pro season. Overall in the NFL, Culpepper threw for 24,153 yards and 149 TDs, and also rushed for 2652 yards and 34 touchdowns. He twice received first-team All-NFC recognition and was selected to three Pro Bowls.